How far in advance before I travel should I visit the clinic? Consult us as soon as possible. In general, 4 to 6 weeks is early enough, but some trips require 2 or 3 visits. Some countries in Africa and South America may require the yellow fever vaccine. The vaccine for meningitis is required for pilgrims to Mecca, Saudi Arabia. Do I need vaccines for a tropical destination (e.g. Cuba, Mexico, Dominican Republic)? Some vaccines are recommended, such as hepatitis A and B, and an update of your tetanus and polio shots. Can I get vaccinated if I'm taking antibiotics? There are no contraindications for receiving most vaccines. However, if you have fever, it is better to delay vaccination. What is the average duration of a visit to your clinic? Expect to be there about one hour, including a mandatory 30 minute observation period after vaccination. What is the closest metro station to the clinic? Our clinic is located between Langelier and Radisson metro stations. Are there any vaccines for malaria? Currently, there is no vaccine available to prevent malaria. However, we prescribe anti-malaria drugs, which you should begin taking before you travel to a high risk area. The side effects are generally minor and well tolerated, even in very small children. Our staff can also advise you on protection from mosquitos. If I'm leaving in two days, is it too late to receive vaccines? The hepatitis A vaccine, for example, provides good protection even if you take it just a few days before departure. We also offer boosters for basic vaccines such as diphtheria, tetanus and measles. I have fragile intestines and I often experience travellers' diarrhea (turista). Can you help me with this problem? Travellers' diarrhea is a common, disturbing problem during overseas travel. When you visit our clinic, a healthcare professional will advise you on prevention means, and traps to avoid. You can even obtain a prescription for antibiotics to treat diarrhea, if necessary. The oral vaccine Dukoral protects against travellers' diarrhea. I plan to travel to Europe, do I need to be vaccinated? Some vaccines may be recommended for a stay in Europe. Depending on the countries visited and the type of stay, hepatitis A and B vaccine or the typhoid fever vaccine may be recommended. What should I expect if I receive several vaccines at the same time? Most often, the vaccines administered have few side effects or none at all. At the injection site, slight pain or local redness may appear, usually for a very short time. Some live vaccines may trigger more systemic side effects. I have many health problems and I'm taking several drugs. Can I be vaccinated? Traveling abroad when you suffer from some illnesses may pose risks to your health. It is essential that you be protected from some infections by appropriate vaccination. Also, make sure you have all your drugs in your carry-on luggage and purchase travel insurance before you leave. I am pregnant and will soon be travelling. Is it dangerous for me to be vaccinated? Pregnant women can safely receive inactive vaccines. Avoid regions where a live virus vaccine (yellow fever) is required. Our health professionals can recommend preventive measures, safe vaccines and antibiotics treatment appropriate for your condition. If I come back from a trip with health problems (fever, diarrhea, skin condition, etc.) what should I do? It is important that you consult us as soon as possible after you get home. One of the clinic's physicians can meet with you and assess your health status, do a checkup or treat you depending on the problem. The service is covered by Medicare. I am going on a luxury cruise, do I need to be vaccinated? Depending on the countries visited, we recommend some vaccines even for a luxury cruise. Also, we can advise you on how to prevent seasickness. I missed the scheduled date for my hepatitis A and B vaccine shots. Do I have to start vaccination all over again? No. Simply continue the vaccination schedule; this will not hinder the efficacy of the vaccine. You cannot take a shot earlier than scheduled, but you can exceed the date without a problem. I was born in Africa. Am I protected from high risk diseases if I return to the continent? Even if you were born in the region that you are planning to visit, this does not necessarily mean that you are protected from yellow fever, meningitis, tetanus, polio and other diseases. 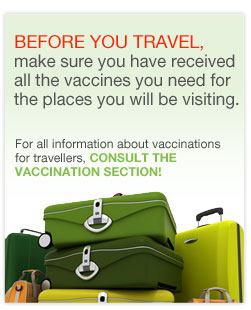 Like any other traveller, your vaccination needs should be assessed by a travel health expert. Don't forget to bring your vaccination booklet even if your prior vaccines were administered abroad.